Taiwanese Police marked M-1 Carbine, Inland receiver with a 6-44 marked Inland barrel. Taiwanese Police marking on the receiver. No other markings on the barrel, gun bunny behind the counter said the guy who had it on consignment got it in the 60's before import markings were required. This was in the forward of the handguard. I'm thinking it's a shim of some kind the last owner used to try to increase accuracy or maybe the hand guard had more play than he liked. Everything felt fine when I took it out. It's a Royal Thai Police carbine made for them by Howa Machinery Ltd of Japan. The original barrel may have been replaced with an Inland barrel. Howa made their own barrels. It's typical for the other Howa parts to be unmarked. This is a very interesting find. COOL. When the counter guy told me it was a rebuild in Japan I figured the lack of markings on the trigger group meant it used a Howa group. I'll check the receiver again tomorrow (out for a bit) and see if I can see any Inland markings under the rear sight. It would be unusual to find a GI receiver with the Royal Thai Police logo. I believe only Howa receivers were used. Another clue would be the shape of the rear portion of the receiver. It would have an extended flat to support the Howa rear sight. I can't tell from your pictures. Your TH is definitely Howa as is the operating slide (I can see the characteristic step in the TH lug as well as portions of the grooves in the slide handle). Are there any markings in the sling well? I think it's more likely that the barrel was changed when it was imported. There were reports of barrel damage noted by the importer. That would also explain the GI front sight. About 8-10 years ago, one of the front row vendors at the Knob Creek Machine Gun Shoot had about 30 of the Howa Carbines available for sale at $600 each. I looked over every one of them, intending to buy one, but for some reason, I passed. This was one of those times I wish I had decided differently. The lowest serial number I observed was in the 1800 range. Anyway, I wish I would have purchased one. They were all the same as this one, featuring the Thai crest. [QUOTE=David Albert]About 8-10 years ago, one of the front row vendors at the Knob Creek Machine Gun Shoot had about 30 of the Howa Carbines available for sale at $600 each. I looked over every one of them, intending to buy one, but for some reason, I passed. This was one of those times I wish I had decided differently. The lowest serial number I observed was in the 1800 range. Anyway, I wish I would have purchased one. I did the research and authored the web pages on the Howa carbines. Since yours has the logo of the Royal Thai Police on the front of the receiver the entire carbine was made by Howa for the Royal Thai Police. Take a look at the top of the trigger housing lug at the rear of the trigger housing. That step is a hallmark of one Howa made. Ditto the vertical serrations in the slide handle. Your front sight and barrel are replacements for the Howa parts that were there. Most likely put on the carbine by whoever imported it. Ditto the stock and handguard. Are there any markings or a logo on either side of the rear sight? The rear sight used by Howa on those for Thailand is fairly distinctive and yours wasn't one of them. Howa made stamped adjustable rear sights for the carbines in the 50's but not used on those made for Thailand. Take a real close look at the left side of the receiver between the rear of the receiver and slide track and see if there are any markings there. All of the Thai carbines were bought by a Canadian company. Those in the USA the vast majority were purchased from the Canadian company by Old Sacramento Armory in Sacramento, CA using the name New Helvetica Corp. Thus the initials NHM. They put the import mark on the barrel for some of them. But if Old Sac sapped out the Howa barrel it wouldn't have the import mark. Check the receiver as shown above. A few, and meaning a handful, were imported by a few collectors using a couple small importers. I spoke with 2 of the employees who worked at Old Sac Armory when the Howa's arrived. The condition of the carbines was what one might imagine from having served in a jungle environment subject to monsoons. Most the wood was rotted and/or broken. Many the barrels were bulged inside the bore from having been fired when the barrel bore was blocked. Likely by mud and debris but possible due to a bullet lodged in the barrel. Old Sac tried to sell them without doing any work. They got so many returns they regrouped. Refinished the metal and replaced the parts that needed to be replaced. I would need to see closer pics of the various parts to attempt to ID which are Howa vs GI replacements done by Old Sac Armory or an owner afterwards. You paid the average price they been selling for recently. Thanks Jim, when I can get to my friends house again to get a look at it (work should be done on my place this week, then I gotta move the safe's back) I'll take better pictures. Sounds like the importer or past owner did the work needed to get a functioning carbine out of it, if it shoots I'll be happy. OK, I looked on the left side receiver track, if I looked at the right spot there's no import markings, must have been on the barrel. I believe your Howa receiver was modified to accept the USGI sight. The rear flat surface behind the dovetail was originally wider on the Howa receiver than on a USGI receiver. The "H" in a shield on the rear sight is not for Howa. It was made by Hemphill Mfg. Co., Pawtucket, R.I. 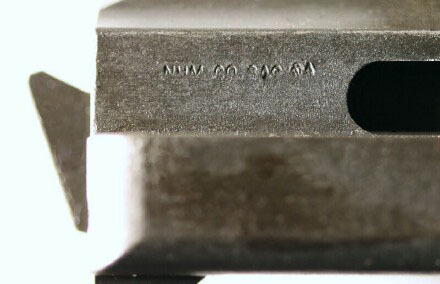 Commonly found on later Winchester carbines. Also, the recoil plate appears to be a cast post war replacement possibly made by Rock Island Arsenal. Note the visible parting line. The Howa recoil plate would have been machined, not cast. By the way, nice pictures! Hmm, either Howa changed how they made the receiver or something is amiss. Take a look at the length and style of the slide slot Jim posted and compare to yours, clearly different. Then there is the rear of dovetail differances. Howa should not be able to accept a adjustable rear sight. I won't be able to get to my buddies house again till weekend after next, going out of town this coming Friday. @Dan, good observation. Also, note the proof punch mark on the receiver in front of the rear sight. You don't see this on other Howa receiver images online. Maybe this is a GI receiver with the U.S. markings removed and Howa markings added. Jack, that was my thought. With receiver details I might be able to figure what make. Also very interesting is the front ring, wonder if ruminants of original marks. I just reread you post and you said "inland receiver with inland barrel"